This is an antioxidant supplement for memory enhancing which supports blood circulation to the brain and extremities. 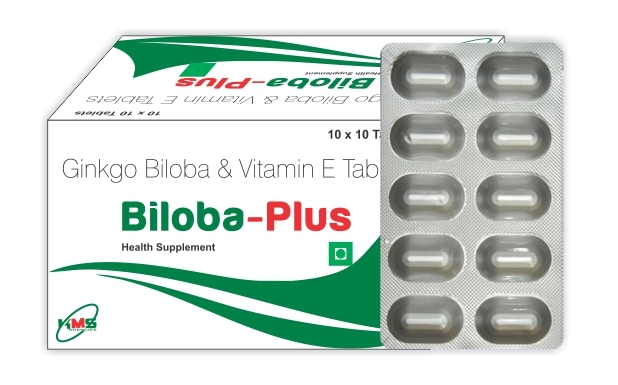 In this combination Ginkgo biloba with Vitamin E stops blood vessels constricting; they also prevented blood from becoming too "sticky" and reduced damage to cells. Reduction of blood supply in brain may cause to memory loss and stroke. Ginkgo improves blood flow to the brain and acts as an antioxidant and also boost memory and cognitive speed. Ginkgo biloba supplements are often used to help improve circulation and to help with memory. The two main beneficial chemicals in this plant are flavonoids, which work as antioxidants, and terpenoids, which improve circulation. While Vitamin E needed to prevent loss of critically important molecule in the brain. Vitamin E is associated with brain protection and reduced Alzheimer's disease progression. Vitamin E help reduction brain damage caused during stroke. This supplement is used for dramatic loss of a critically important molecule in the brain, and helps in memory loss after stroke. This supplement are often used to help improve circulation and to help with memory. Memory loss commonly occurs as a result of the loss of nerve cells in the brain. When memory loss is so severe that it interferes with normal daily functioning, it is called dementia. People with dementia may have difficulty learning new things or remembering names of people they just met. They may get lost in places that were previously very familiar or have trouble finding words. The term "mild cognitive impairment" is used for a common condition in elderly people in which the memory problem is usually mild and does not interfere with normal daily activities. Most people with mild cognitive impairment do not develop a severe memory problem or end up developing dementia. There are many things that can cause dementia. One of these is Alzheimer's disease (AD), the most common cause of dementia in the elderly. Another is called vascular dementia, caused by brain damage due to strokes. Ginkgo biloba and Vitamin E both are antioxidants which has potential protective effects against Alzheimer's disease. Antioxidants are substances that neutralize free radicals (damaging molecules created as the body uses oxygen). Antioxidants are naturally occurring compounds that slow down the aging process and protect you from the harmful effects of free radicals. They are caused by exposure to everyday occurrences such as stress, lack of sleep, physical exercise, grilled meat, fried food, air pollution, and radiation from your mobile phone and computer. This supplement is good for brain and prevent mental decline as we age. Ginkgo biloba with vitamin E can minimize the damage caused by a stroke, by redirecting blood supply it can prevent brain cells from dying after the event, keeping a good memory, slowing memory loss, and even lowering the risk of getting Alzheimer's and dementia. So, this antioxidant supplement binds to free radicals, rendering them harmless and enhances cognition by supporting and enhancing the function of nerve tissue. Although oxygen is essential for life, it can have adverse effects on your body. Unstable oxygen molecules can often be created during our body's normal break down and use of oxygen or can form in response to external factors and pollutants. These unstable molecules, called free radicals, can damage cells and structures within cells. If the genetic material in cells is affected and not repaired, it can replicate in new cells, contributing to cancer and other health problems. These free radicals may also weaken artery walls, allowing fatty deposits that can lead to diseases. As an antioxidant, Ginkgo biloba combats free radicals and repairs molecular damage. A great deal of research suggests that antioxidants such as GBE may play important roles in preventing or delaying heart disease, cancer and other ills. Antioxidants may even halt the damage to cells, thereby slowing the effects of aging. Ginkgo is widely touted as a "brain herb." Some studies show that it does help improve memory in people with dementia. Some studies suggest it may be useful in the treatment of Attention Deficit Hyperactivity Disorder (ADHD). Ginkgo is often added to nutrition bars, soft drinks, and fruit smoothies to boost memory and enhance mental performance, although such small amounts probably do not help. Antioxidant, protects your cells from oxidation, and neutralizes unstable free radicals, which can cause damage. Vitamin E is considered antioxidant nutrient because it help to neutralize free radicals, toxic molecules that damage healthy tissue in the body. Vitamins E may benefit memory and prevent age-related memory loss by protecting the cells of the brain from damage and help stop dementia. In the last decade, the functions of vitamin E have been further clarified. In addition to its antioxidant functions, vitamin E has now been shown to directly affect inflammation, blood cell regulation, connective tissue growth, and genetic control of cell division. However, some side effects may be possible: Upset stomach, Constipation, Stomach Cramps, Forceful heartbeat, Nausea, Diarrhea, Allergic skin reactions. The Do not take during pregnancy and lactation. Do not use in bleeding disorders or while using the drugs which decrease blood coagulation.